Weather monitoring plays an important role in human life, so the collection of information about the temporal dynamics of weather changes is very important. In any industry during certain hazards, it is very important to monitor the weather. 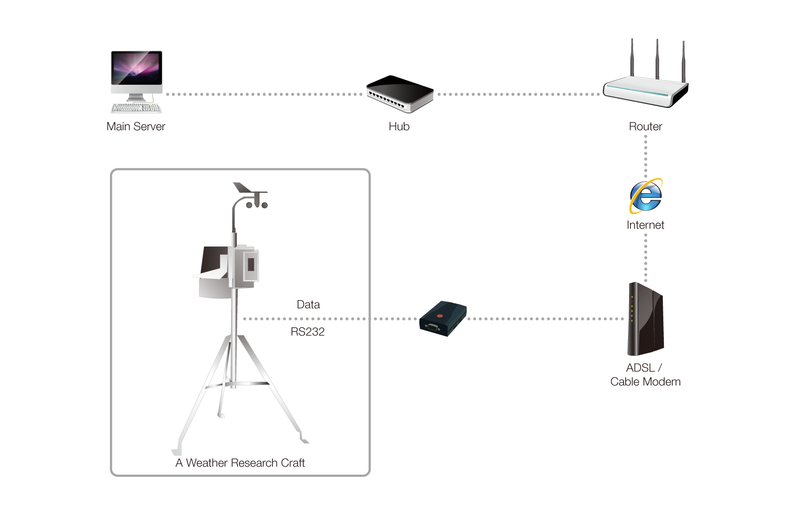 This is an example of weather monitoring system where Sollae Systems' serial to Ethernet converter is applied. Weather observation system contains many weather measuring equipment: anemometer, weathercock, barometer, thermometer, hygrometer, snow-depth meter, and rainfall gauge. Most of the equipment has a serial port to send data to the main server. The majority of the equipment is located away from the main server. By applying Sollae Systems’ serial to Ethernet converter, the distance between the main server and the measuring equipment becomes less problematic. In this way of sending and receiving data remotely through network makes fast transmission without errors in real time. Besides, because our devices system is based on TCP/IP, it is very easy to link with WEB and smartphone APP.